According to John Mariani’s Dictionary of American Food and Drink, this bread dates back to the time of the Puritans. One theory is that 17th-century settlers steamed bread because few of them had ovens, and it was an easy way to make bread over an open fire. But other food historians claim that this bread didn’t exist until well into the 19th century, and that it was predated by baked yeast breads like Rye and Indian, made from rye flour and cornmeal. So I’m not sure this is truly colonial bread. (On days like this, I feel like calling my blog Possibly Revolutionary Pie.) At any rate, it’s very old. It was usually steamed in cylindrical or melon-shaped metal molds, and eventually the resourceful New Englanders started using coffee cans, a tradition that continues today. 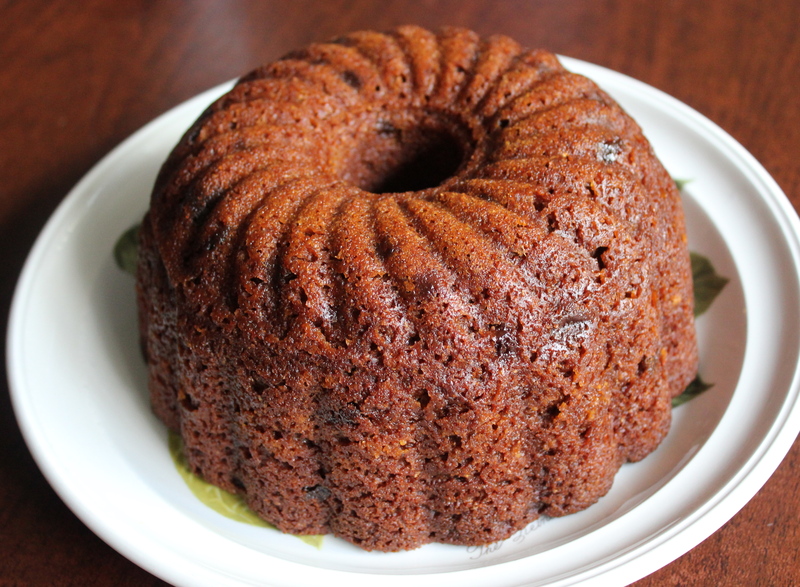 I used a one-quart metal pudding mold, which would have been typical in the 18th or 19th century. I followed a recipe by Evan Jones from American Food, with some help from Laurie Colwin’s Home Cooking, one of my favorite cookbooks of all time. This bread takes a while but is very easy and worth the time. 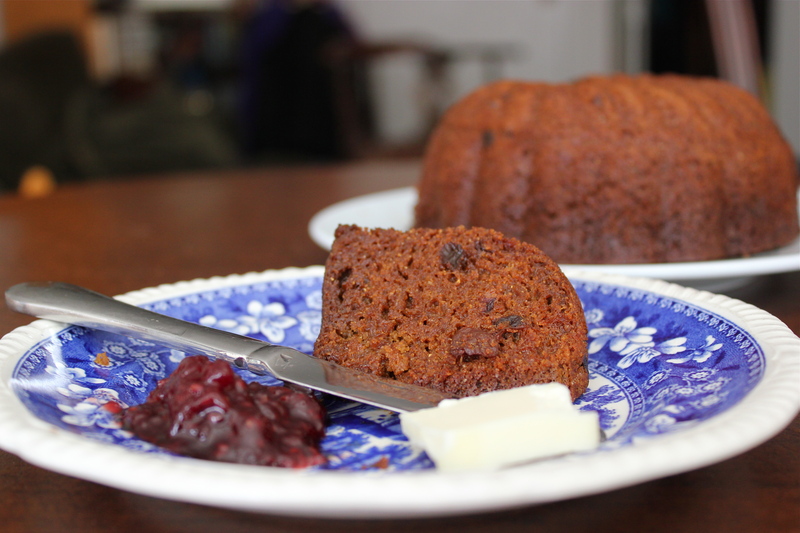 It has the consistency of a moist muffin, with a rich molasses flavor that improves over a day or two. There are two steaming methods for brown bread, and I tried both. You can let the pot simmer on the stovetop or in the oven. Either way takes three hours, and the results are pretty similar. The oven method is a little simpler because you don’t need to adjust the heat. I think the oven-steamed bread was slightly drier, but not too much so. I liked them both! 1. Sift the rye and whole wheat flours with the baking soda, baking powder, and salt into a large bowl. 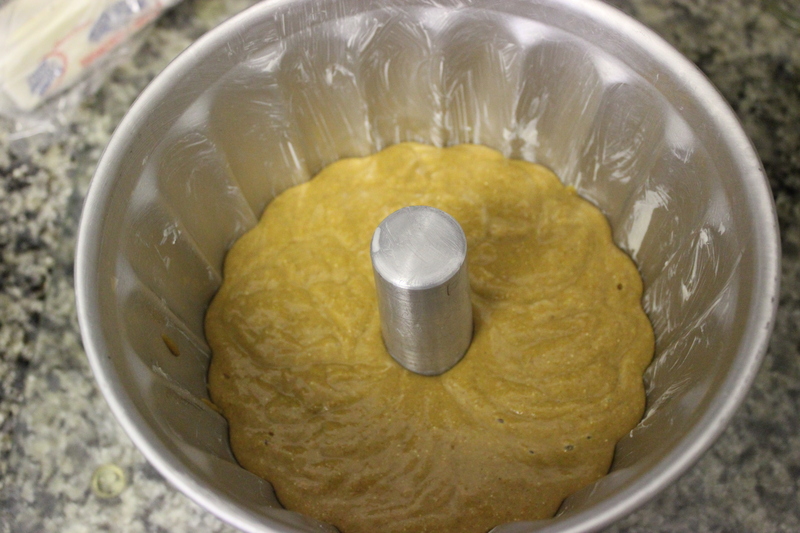 Add the cornmeal and mix well. Stir the buttermilk and molasses together, and add to the flour mixture. Blend well, then fold in the raisins. 2. Butter a 1-quart pudding mold generously, including the inside of the lid. Pour in the batter. 3. Carefully remove the mold from the pot. Take off the lid and place mold in a 300°F oven for 10 minutes to dry the bread a little. Remove from oven, let sit for a few minutes, then invert the mold to release the bread. Serve warm. Bostonians traditionally eat this bread with baked beans for Sunday supper. We’re not fans of baked beans, so we just slathered on butter and jam. Note: If you’re interested in making this bread using coffee cans, see Aimee Seavey’s “Brown Bread in a Can” on YankeeMagazine.com. Or if you’re feeling very lazy, you can buy the above-mentioned B&M Brown Bread on Amazon or at vermontcountrystore.com. This entry was posted in breads and tagged Boston, Brown bread, cornmeal, history, Laurie Colwin, Molasses, New England, Rye and Indian bread, rye flour, whole wheat flour by revolutionarypie. Bookmark the permalink. I am temped to try this one! You should, you New Englander. Let me know how it turns out if you do. It is funny…I live in New Hampshire but I haven’t seen canned brown bread. Your bread looks terrific. Hi Karen, thanks for visiting! My mother used to live in southern New Hampshire, and that’s where she started buying this bread. Maybe her local grocer carried more old-fashioned products than most stores do these days. I grew up in the 60’s/70’s Connecticut and “Franks and beans” with brown bread was not an uncommon supper. I now live in a place that will never stock B&M canned brown bread, I’m looking forward to trying your recipe. I am still looking around for B&M bread in New York City, but never see it. Anyway, I hope the recipe works well for you, and thanks for visiting. Well, I made this today and it turned out beautifully! This kitchen smells pretty nice as well. Thanks for the recipe, I will be making this again. Interesting, Leanne. I don’t know why it’s so much harder to find in the NYC area than around Philadelphia. Different demographics? Who knows!